Welcome to Carlin's Automotive Repair & Service! 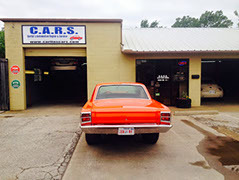 We are a full service auto repair facility established in 1997. We specialize in repairing foreign and domestic cars and light trucks. We serve the South Dallas area, including Duncanville, Cedar Hill, Desoto, Lancaster, Grand Prairie, Oak Cliff, Midlothian, and the Lake Ridge Area. We are located in the center of Duncanville, next to the Library and Community Center (and surrounding walking paths). We are within two blocks of Armstrong Park, Kidsville, and several restaurants. We have an air-conditioned waiting room with TV and WiFi access and also have a loan car available to our customers. Estamos un taller mecánico con servicio completo, establecida en 1997. Especializamos en reparar autos extranjeros y domésticos y camiones ligeras. Servimos areas cerca a Dallas, incluyendo Duncanville, Cedar Hill, Desoto, Lancaster, Grand Prairie, Oak Cliff, Midlothian, y la area de Lake Ridge. Estamos ubicados en el centro de Duncanville, cerca a la biblioteca y Centro de Communidad (y hay senderos para caminar). Estamos dentro de dos bloques de Parque Armstrong, Kidsville, y unos restaurantes. Tenemos sala de espera con aire acondicionado, aceso de WiFi, y TV. También hay un coche de prestamiento disponible por los clientes cuyas reparaciones de vehículo se llevará a muy largo tiempo. A/C, connected bathroom, TV, WiFi, Keurig coffee machine, a fridge stocked with bottled water and sodas, a fish tank, and a selection of popular magazines.